You or a family member may be concerned about the “big two” killers (cancer and Alzheimer’s.) This month we focus on cancer and the July issue will be on Alzheimer’s. By the way, every year these suggestions get so many rave reviews that they are re-sent, forwarded and “re-gifted.” Feel free to do so yourself. Many have heard that there is some randomness to getting cancer. A study got quite a bit of publicity when it said the majority of cancer is just “bad luck” (Tomasetti & Vogelstein, 2015). But a careful reading of the study showed they used a very select few tissue samples (31), and it excludes the most common cancers like breast and prostate cancers. The study is too small to generalize their data. Many highly renowned researchers have already denounced the study. Do not buy into this; it was not generalizable science. Truthfully, there is some bad luck, but not much. The majority of all cancers are preventable. In fact, the heritability of most cancers is between 5 and 10%. That’s why you want to focus on environmental factors. How much “weight” do you carry every day? Isn’t work challenging enough without adding weight? We have all begun a new calendar year. For some, there is already stress and more of the same challenges from last year. But this post has answers for you. 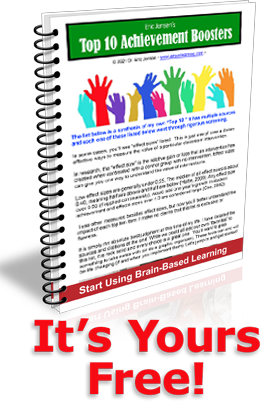 This is all about using something FREE to help your brain in the decision-making process. It works for you, your colleagues, your family and your students. Can Teachers Move Students Of Poverty To Middle Or Upper Class? 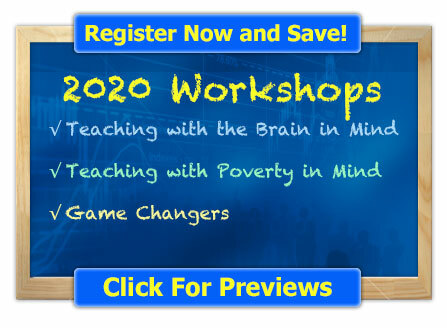 Drew Perkins talks with author Eric Jensen about his book, Poor Students, Rich Teaching: Mindsets for Change (Raising Achievement for Youth at Risk) and how he believes teachers can change their mindsets to help students of poverty move to the middle or upper class. Contrary to popular belief, DNA is not a child’s destiny. IQ is not fixed. Cognitive skills can change. This is critically important in K-12 schools because of the poverty gap — the difference between a child’s chronological age and developmental age. In a healthy environment, a child’s developmental age will match his or her chronological age. In a high-risk environment, research shows that while a child’s chronological age is 5 years old, his or her developmental age is closer to 3 years old. This has a huge impact on school readiness and performance. U.S. Secretary of Education John King’s voice wavered slightly during the July 27 conference call, as he recounted his personal battles with poverty and homelessness. King was addressing members of the media about new proposed policies under the Every Student Succeeds Act, which will support mandated local liaisons in school districts to help identify and offer resources to students who classify as homeless. They will also help to clarify the unique needs of the rising homeless student population, which includes more than 1.3 million children throughout the country. More than half of the nation’s public school children were low-income in 2013. He also indicated that the Obama Administration has committed increases in funding to support programming support for homeless students — about $85 million for the next academic year. But many wonder if the federal government’s support will be enough to solve the growing crisis, with far reaching impact on educational service delivery and performance metrics. Social justice outside of education typically incorporates public views on inequalities in housing, income, and criminal justice administration. But for the children growing up in environments where these challenges impact their daily lives, the learning outcomes typically create another vicious cycle of divesting — through suspensions, expulsions and negative classroom experiences. Jensen said to combat the impact of poverty in the classroom, teachers should have way more empathy before judging students’ ability and work to avoid judging students altogether.”That’s easier said than done, but teachers must understand kids don’t choose parents, neighborhoods, DNA. So when they are being impulsive, challenging authority — these are symptoms that have been in literature for more than 30 years,” he said. Biochemically, Jensen said, elevated levels of cortisol can destroy brain cells. This change creates risk factors for depression, anxiety and anger, all which can be enhanced by environmental factors like unhealthy living conditions, violence or drug abuse in the home. These factors can limit exposure to complex language, listening and responding, and slows the brain’s capacity to handle processing, like rapid speaking. To solve the issues, Jensen recommends schools emphasize relationship building and cultures of respect and encouragement for students. While it is a difficult proposition to ensure quality teachers at every level throughout a secondary career, Jensen said that five years of holistic learning and accounting for the effects of poverty, can all but eliminate their impact.